funding gap | En Avant! The railway’s cost allocation system is dumping costs on the sector least able to afford them – regional rail. It must be changed. And so it came to pass that the Office of Rail Regulation issued the subsidy figures for the different parts of the railway which were engraved on tablets of stone. And a hush descended as the great multitude of executives, lawyers, consultants, officials and economists, and others of the vast and well renumerated tribes of the privatised railway, gazed upon them. Verily those regional railways look expensive they thought. Useful stats if we need to give them a good kicking later on. I adopt an ersatz biblical tone because the way in which the subsidy figures for different parts of the railway are presented is often done as if they were written on tablets of stone. Absolute truths handed down by a greater intelligence. However as our recent report, ‘A heavy load to bear? Towards a fairer allocation of rail industry costs for regional rail’ shows the reality is that they are constructs based on choices on how costs are allocated to sectors. Choices which are often political. Choices which in the Beeching era were made to justify a frenzied application of the axe. Choices which in more modern times, during rail privatisation, were made to create a ‘profitable’ intercity network and a ‘how much do they cost! ?’ regional rail network. Once you summon up the courage and mental fortitude to cross the threshold of the intimidating edifice of the railway’s cost allocation system and into the cloistered world of railway economics that lies beyond it, the bias against regional railway which was built into the privatised system from the outset, becomes startlingly apparent. Firstly, and obvious to the naked eye, is that by and large, cross subsidy within the passenger rail network was dismantled so that the regional railways that feed the intercity networks were separated out. However, delving deeper this is compounded by a disproportionate and entirely unfair allocation to regional rail of both the overall costs of the railway, and of other rail sector’s costs. This dumping of costs on the sector least able to afford them took place in a number of ways. Here are two of the most pernicious ways in which it was done. Inter-city trains are estimated to produce twenty times the track damage of a Pacer – yet they are allocated equal shares of maintenance and renewal costs. Secondly, regional rail received only 18% of new investment by Network Rail but regional rail contributed 30% of fixed track access charges and was allocated of 32% of the financing costs. In other words regional rail is paying for track impacts and damages it didn’t cause, and paying for investment in the railways that it doesn’t benefit from. And then there’s freight. I am all in favour of getting freight off the roads. I have no problem with railfreight not paying the full costs of its impact on rail infrastructure in order to achieve this end. I think the railfreight lobby has been determined and effective in fighting freight’s corner. A far better job than the regional rail lobby has done (though that in itself is not difficult as there isn’t one). Rail freight’s hard won status as a marginal user of the network is also another example of how cost allocation is less of a saintly practice of pure and spotless economic rationality than the consequence of politics and hard bargaining. I don’t have a problem with that either. But better to be honest about it. If rail freight is a marginal user then there’s a strong, though slightly different, argument for regional rail to be a marginal user too. Regional rail takes traffic off the roads (benefitting remaining road users); gives commuters access to city centre jobs and opens up rural areas poorly served by road for inbound tourism and outbound access to opportunity. 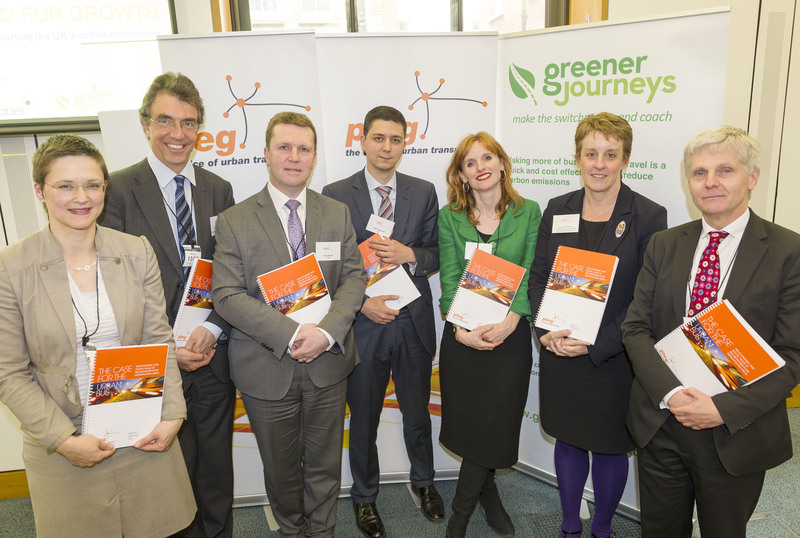 All of which benefit a host of wider Government objectives for growth, jobs and the environment. At the same time regional rail generally causes less damage to the infrastructure than other sectors, generates the least income, and requires the least fancy engineering. If it were to vanish tomorrow the majority of the bills of the railway would still need paying. Why on earth therefore should cash strapped regional rail be the one that always gets its, and other peoples’, rounds in at the bar? And worse, ending up with the equivalent of a pint of dodgy mild whilst paying for others’ premium lagers and cocktails. What happened to regional rail’s costs at the point of privatisation shows just how extreme the effect of this change in the way costs were allocated was – and what a construct are those cost per passenger kilometre, and subsidy figures by train operator or sector. Before privatisation the costs allocated to West Yorkshire’s rail network was £14 million, the minute after the new privatised cost allocation system came in (with the same trains and the same network) the costs increased to £43 million. For Centro the costs increased overnight from £33 million to £62 million. All clever stuff then. All confirming London Government’s prejudices about the value of any service that doesn’t stop or start in London. All neatly positioning regional rail on the scaffold’s trapdoor whilst at the same time showing that rail privatisation created seemingly real inter city businesses that made real profits. All of this matters right now because these flawed subsidy figures are hanging over the re-franchising of the North’s railways. Right now the narrative feels like the future’s bright, the future’s rail. But really, just look at how much those regional railways cost and draw your own conclusions. We will do what we can for you but those figures speak for themselves. But what would the figures look like under a fairer, more defensible and more rational system for allocating the railways costs? 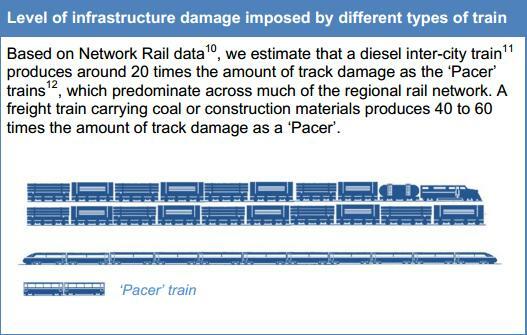 If costs were allocated more in proportion to estimates of track wear and tear by different sectors? If overheads were allocated to prime users? If the track access charge payments that relate to infrastructure investment better reflected where that infrastructure investment was made? Our report estimated that if that were the case then government support for regional networks would be more than a third lower than ORR currently states it is. Subsidy per passenger kilometre figures also change significantly. ORR’s figures of 22p per passenger kilometre for regional rail and 4p for InterCity becomes 17p for regional rail and 12p for intercity. What our figures show is that regional rail networks go from receiving more than half of all government funding to a share of just over a quarter. 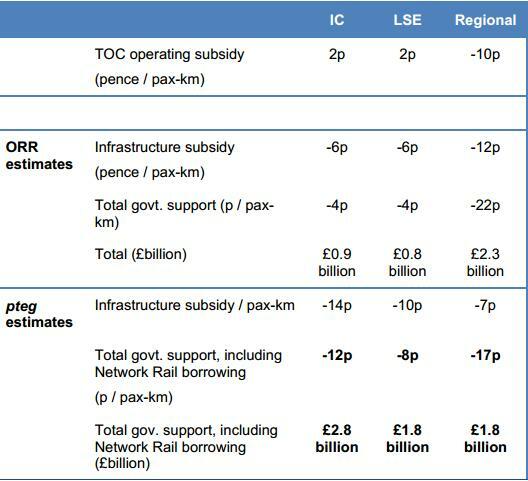 Regional rail passengers still receive the highest level of subsidy per passenger-km but it now becomes clear that this is driven by operating subsidy rather than infrastructure spending. Real subsidy levels are also shown to be much closer between Inter-City, London South East and Regional networks than previously thought. The low level of infrastructure spending in regional networks also goes a long way towards explaining the high level of operating subsidy. Investment and the quality of infrastructure clearly play a key part in the ability of regional rail to attract passengers and thus generate additional revenue. Investment (or lack of it) is also a determining factor of train operating costs. For example, increasing train speeds can reduce costs, attract passengers while making future frequency enhancements cheaper to deliver. In that sense, it is not surprising that decades of underinvestment in regional rail infrastructure will lead to a widening gap in terms of subsidy requirements relative to other parts of the network. It would take a relatively small increase in demand and yield (or, conversely, a fall in unit operating costs) to bring regional rail subsidy in line with subsidy on the rest of the network. This shouldn’t be hard to achieve given the relatively low mode share of rail in the regional market and the rampant growth observed following service improvements. Overall the case for investing to save (rather than handwringing and penny pinching) on regional rail looks far stronger. More realistic numbers about where costs fall also tie in with the realities on the ground about regional rail which is that regional rail fits so well these days with how the North’s economy is developing. More people commuting longer distances to access high value jobs in city centres that can’t cope with much more road traffic; people taking to the train to avoid the hassle of driving and parking in the North’s many wondrous national parks and revitalised urban centres; and town and city economies that are starting to fuse and synergise. That’s why regional rail patronage has been soaring – even on routes where Whitehall lumbers is with Britain’s worst and oldest trains running at collective punishment frequencies. A cost allocation system that is still playing out trace memories of Dr Beeching’s creative accounting, as part of a dusty Whitehall long game over regional rail now, looks as out of touch with what’s good for regional economies as communicating with tablets of stone. The last spending review gave local transport spending outside London a good hiding. It lacked the political clout and built-in funding commitments that applied to London and national rail – the evidence base for the benefits of local transport spending also had too many gaps. Worse for the big regional conurbations was that by accident or design a significant shift has also taken place within local transport spending as decision after decision on funding formulas redistributed funding from congested urban areas in the regions (where it would do most good) to quieter rural areas – or the wider London commuter belt. Will June’s spending review be more of the same? 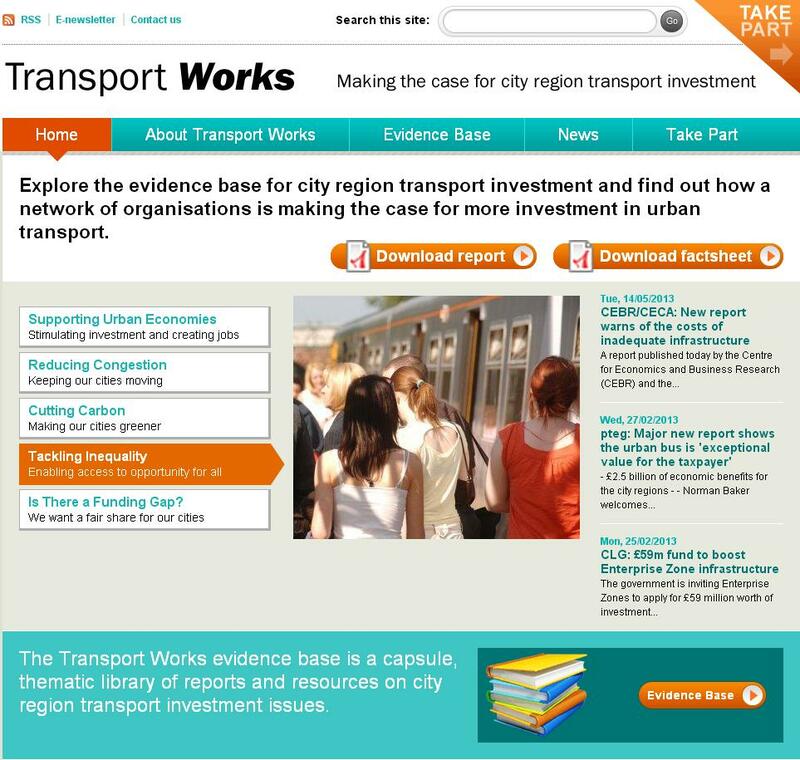 Well if it is it won’t be because of the evidence base – which we have systematically upgraded since the last spending review, and encapsulated it on the www.transportworks.org website. From our report from Jacobs on the benefits of small public transport schemes to our recent ‘Case for the Urban Bus report’ we have made it our business to build a defence of local transport spending that George Graham would have been proud of. If there’s some big gaps in the evidence base for local transport spending then neither HMT nor DfT has told us what these are. Which brings us back to politics. On resource spending there’s a three-way dogfight. The cash avalanche from Whitehall into London’s transport system started when London showed it was willing to put its hand in its own pocket with the congestion charge. Since then The UK’s resident world city has been adroit in ensuring the national public funding that has headed TfL’s way has been well spent in renewing the fundamentals whilst making some transformatory and decisive shifts in the whole direction of transport policy – not least of which is on cycling. But the public spending squeeze has led to a change in approach from London with a stress on the potential for the capital to raise more of its own funding from its pumped up, city state tax base. This is also to demonstrate to Whitehall that London ‘gets it’ that when public spending is being squeezed London needs to get its own round in at the public spending saloon bar. Meanwhile national rail’s resource spend could only be reduced through unpalatable ideological choices on the current structure of the industry or unpalatable political choices (booking office closures, service cuts or strike-provoking moves on staff numbers, pay or conditions). All of which puts BSOG (Bus Service Operators Grant) for the rest of the country in the firing line. In the past support for bus services would have been a soft touch but the case for public spending on bus subsidies is robust and new alliances are being forged in its support – as our recent Westminster ‘Case for the Urban Bus” event showed. Meanwhile on capital funding there’s a more secure consensus around the importance of capital spending on transport to support growth. The question is what kind of capital spend? There’s something primal in politicians’ brains that triggers an urge for road building whenever there’s a recession. Perhaps it’s the trace memories of the 1930s and the heroic images of the New Deal where you could go down to the labour exchange and give men picks and shovels and send them off to build an Interstate. Whatever it is, this urge can be clearly seen in the transport spending figures where after an initial big cut in national roads spending in 2010 there was a change of mind in the 2011 Autumn Statement when spending on national roads suddenly shot up again. But as alluring as big new roads are to national politicians, the economy’s faltering progress and with planning horizons shrinking towards the next election – the case for local transport spending outside London could benefit. This is because small can be beautiful when you want schemes that can be up and running quickly. Road maintenance, bus priority, station improvements, cycle schemes – they can all create and sustain jobs right now to make them happen, and they can deliver rapid benefits in reduced congestion and better access to employment. Plus many of these schemes formed part of rejected competition bids which were ready to roll and can therefore be easily reanimated if funding becomes available. So the big questions that the spending review will answer or fudge: Will the primal political appeal of new roads lead to a further splurge in national roads spend at the expense of local transport? Will national rail remain the great untouchable of transport spending? Will the Treasury wake up to the fact that whilst government talks up spending on cities the memo isn’t getting through when it comes to decisions on funding distribution formula which are actually taking cash out of congested urban areas. Will having a now largely uncontested evidence base for local transport spending outside London result in the better funding deal it deserves? Will London pull it off again? And of course there’s a longer game beyond this spending review. Whatever happens this time round, the evidence base and the credibility of public spending on buses and wider urban local transport spend is now in a much better place. Plus London’s moves towards greater financial independence could also benefit Britain’s other urban areas. It’s been two steps forward, one step backwards and one step sideways on devolution of funding and decision making for the regional cities so far – but Boris Johnson can go toe to toe with HMT on funding freedoms in a way that the regional cities just can’t. Everything to play for!